Awakened Relating is an inspiring and thorough investigation of intimate relationship as a way of embodying our awakened true nature. It is full of wisdom and well as practical guidance about how to bring spiritual illumination into the very heart of our humanness. Highly recommended! This is a wonderful and clear excursion into the inner life of intimacy. Lynn Marie leads us into our true Self where love is already and always fully alive and ready to be shared. I found her insights profound and immensely comforting. Awakened Relating dispels the myth of romantic love and points directly to an awakened way of relating that arises from the recognition of our true nature as Love. Clearly written, deeply insightful, and filled with illuminating interviews and powerful meditative inquiries, this book is a liberating guide to meet the most challenging areas of relationship from the light of Awareness. I highly recommend it! Lynn Marie Lumiere brings together a clear understanding of initial awakening, psychotherapy and intimate relationships in this cutting edge book. Awakening has historically been practiced in monastic settings or as a solo journey. Today awakening is happening in the midst of our everyday lives. So it is most important to bring open-hearted awareness to our intimate relating. Awakened Relating is both an important and timely book that opens the dialogue about awakening and relationships. Breaking new ground, this wise and eloquent book offers detailed guidance in embodying our radiant, boundless, undivided true nature in the realm of intimate relationships, where relational wounding and unresolved childhood issues may make it challenging to live from the limitless love we know ourselves to be. 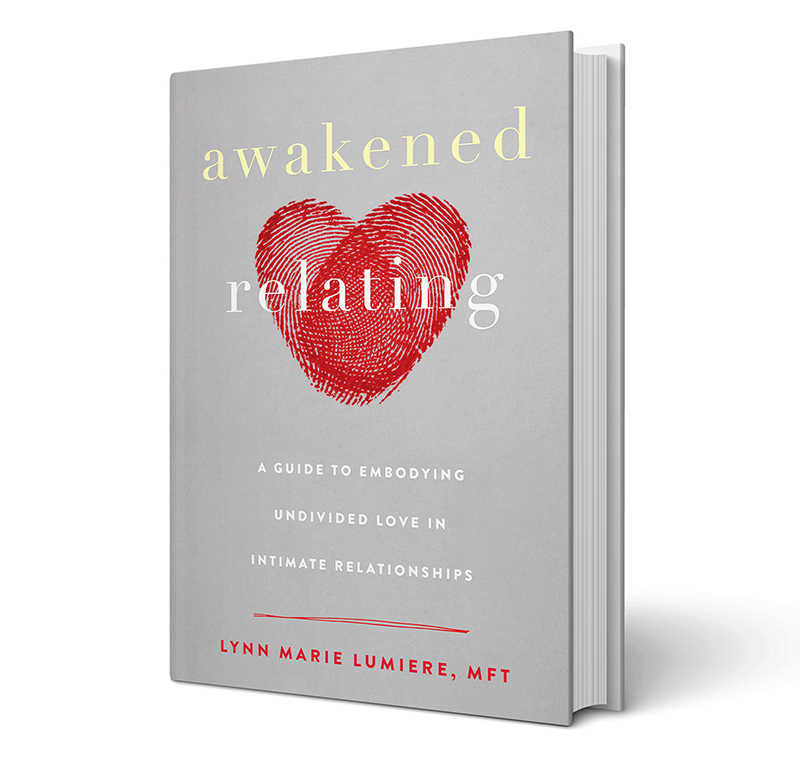 Awakened Relating is based on over 40 years of daily, unrelenting commitment by Lynn Marie Lumiere to discover and share the egoless state of nondual awareness in the midst of intimate relationships and as a therapist of the highest caliber. Lynn Marie dives into the inherently unreliable and unforgiving enterprise of seeking love outside ourselves in apparent separate others. The gems of guidance, vision and opportunity that Lynn Marie has discovered and now offers us in this book are deep, expansive and profound. Many authors and teachers have acknowledged the need to ground the timeless wisdom of Asian nondual traditions in the structure of modern, complex intimate relationships. Lynn Marie's book is perhaps the first to show us, step by step, how couples living in this new millennium can support each other, and realize their true nondual nature in the ultimate wisdom of undivided, invincible love. This book is a watershed in the evolution of contemporary nondual wisdom. Using the context of intimate relationship, Lynn Marie invites us to a deep exploration of who we are and how this embodies moment by moment. I love the honesty and vulnerability in which she explores this highly relevant topic. This inquiry and its unfolding is at the cutting edge of spirituality and our human experience. In my view, awakened relating is a necessary step in our evolution that has relevance as to whether or not we survive as a species. With clarity, humility and wisdom, Lynn Marie Lumiere invites the reader into a deep exploration of the undivided and loving Awareness that is at once the source of life and the ultimate healing of our conditioned separation and suffering. The author’s devotion to truth shines through each page as she offers examples from her own life’s journey, her work as a psychotherapist, meditative inquiries, as well as interviews with individuals and couples who seem to be embodying “awakened relating.” In pointing to that which dissolves separation, and has the greatest power to transform our lives, Lynn Marie invites us back home to the Love inherent in our being. Such Love moves us beyond self-improvement projects and beyond resistance to the moment as it is. She offers simple, practical, and profound keys to remaining awake in our daily lives and relationships. Awakened Relating is a beautifully written, thought-provoking book that sheds light on the myriad ways the discovery of the undivided nature of reality can so radically alter the landscape of our relationships. Through examples from her own relationship and compelling interviews with both clients and teachers she has worked with, Lynn Marie explores how the recognition that we are the very fulfillment, wholeness and love we’ve historically sought in our relationships frees us up to love more harmoniously, more unreservedly, more openly and more fearlessly. We are all too often looking for love in all the wrong places. Lynn Marie Lumiere’s book, Awakened Relating, reveals a new direction for our looking, where we discover love that is already present, that pervades everywhere, that is independent of another, that is available no matter how we’re feeling about our partner, and is independent of our life circumstances. We all need to experience a more awakened way of relating, lest we continue succumbing to the call of romantic love, believing it to be authentic love that will lead to our lasting happiness. Lumiere beautifully points out the one true undivided love that is everlasting, can be interwoven into all our human relationships, contains all the happiness we could ever want, and is delivered fresh each moment of our lives. Awakened Relating is accessible, powerful, and enlightening to read. I couldn't put this book down and will be recommending it to all my friends and colleagues. In this inspiring book Lynn Marie has systematically revealed her deep understanding of the myths and realities of love relationships. She has synthesized two vast topics – love relationships and nonduality – and provided a map for embodying unconditional openness as a fully lived, real experience in the midst of the challenges of intimate relationships. The book is peppered with her own revelations as well as juicy interviews and stories of clients and teachers who are awakening from the dream of relationships to the reality of what awakened relating offers. The exercises she offers at the end of each chapter are easy to do, practical and inspiring. I love this book! Drink it in and find new ways to open more deeply to your own true nature and discover greater freedom and love in your most vital relationships. Awakened Relating is an important milestone in the maturing field integrating nondual wisdom with Western psychology. This book takes the conversation regarding relationship as a path to awakening a step further. Offering a generous helping of illustrative examples, Lynn Marie Lumiere points out how discovering and relaxing into unconditioned presence is the golden key unlocking non-defensive intimacy, relational harmony, and wholehearted sexual delight. As the book makes clear, the key to being able to dance with, and delight in, an Other’s differentness, be it their benign quirkiness or irritating reactive habit-patterns, is to open to the non-different, undivided nature that allows for all differences . . .This book shows how the work of relationship can occur as a spacious play, enhancing mutual openness, understanding, delight, and compassion. I sincerely recommend this book to those who understand, or have had a glimpse, or even just an inkling, (as Lynn Marie suggests) that in order to awaken OUT of a conditioned relating, one must awaken TO unconditioned relating. This book points the way. Just reading Awakened Relating opened an access to relational awakening for me that is openhearted, intellectually clear and meaningful. Whether we are looking for love to come to us, in a loving relationship, or contemplating exploring the perfect union, reading Awakened Relating will allow us to see who and what we really are—even if this is only for a short moment, and then another, and then another. As a nondual psychotherapist, I especially enjoyed Lynn Marie’s interviews with people from all walks of life, and her appreciation of the wisdom of both our conditioned self and our undivided Self. Every couple and individual will benefit from reading this whether they are “beginners” or “old timers” to the awakening process. Thank you for writing this!